If you have created an SSH tunnel and already connected to it with SSH, you can configure software to use it. We will describe how to configure firefox and chrome web browsers to use an SSH tunnel. Go to the Firefox Settings. Now go the Advanced (1) -> Network (2) and to the Settings (3). 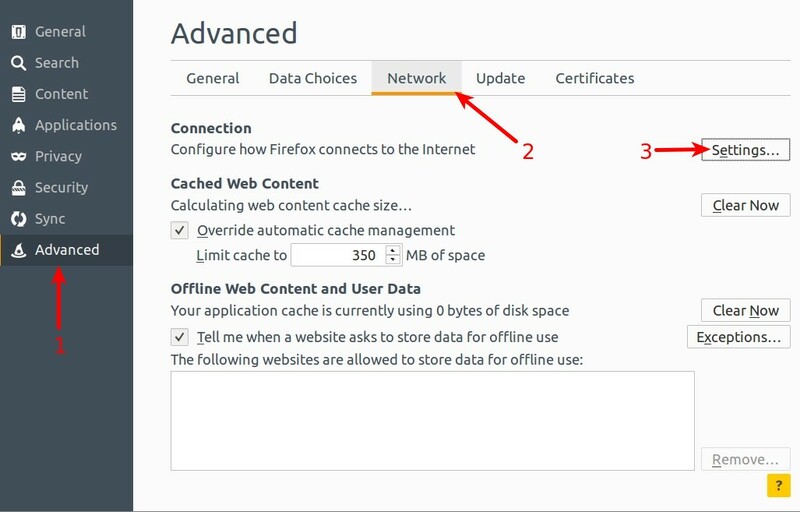 Firefox Connection Settings will pop up. 1. 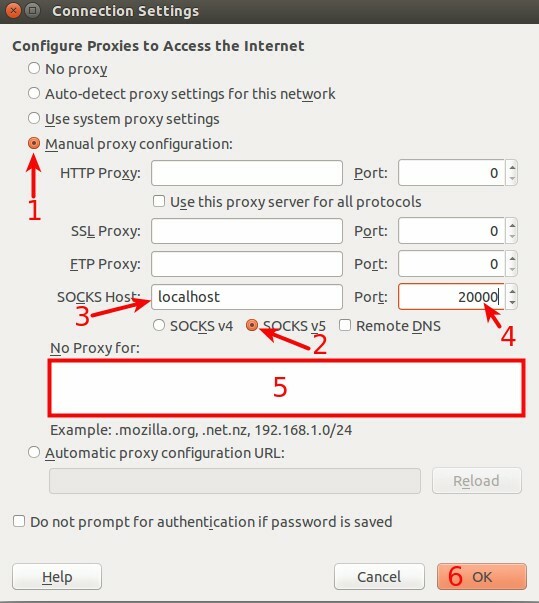 Tick "Manual proxy configuration"
4. In the "Port" field type your SSH tunnel port, in our example we used 20000. 5. In the "No Proxy for" text box, remove everything so that it will be blank. It doesn't support proxy itself, you need to install extension to get it working. Go to chrome extension and search for SwitchyOmega, install it and go to the SwitchyOmega settings. 1. When SwitchyOmega settings pop up, under profiles settings click on proxy. 2. Choose the protocol SOCKS5 from the menu. 3. In the server field type localhost. 4. In the port field type your SSH tunnel port. Now to activate it click on the SwitchyOmega icon in the top right-hand corner and choose your proxy connection. To disable proxy click on the SwitchyOmega icon and choose Direct connection.